Courtesy of Dr. Angel Yanagihara, Alatalab Solutions, Hawaii. Anna Wardley recalled her excruciating experience when she attempted to swim 37 km between Menorca and Mallorca in Spain, "If you want to create a picture of pure hell, I was in it, with the cross-waves throwing the jellyfish against me in the dark and giving me excruciating pain all over my body. It was like having hydrochloric acid thrown all over my body, layer after layer, as I got stings on top of stings on top of stings. I was completely exposed to the onslaught in just my swimsuit." Years ago, biochemist Dr. Angel Yanagihara also experienced the intense pain of a box jellyfish sting off the coast of Oahu. Although the pain was like nothing she had ever experienced, her intellect was engaged and her future research into the chemical makeup of jellyfish venom and the stinging mechanisms of jellyfish in her laboratory at the University of Hawaii. "The microscopic stinging cells of the box jellyfish are present at up to 5,000 per centimeter of tentacle length or for a 18-inch tentacle 225,000 per tentacle. Far more than what was was previously thought." After years of ground-breaking research, published papers and scientific investigations in oceans around the world, Dr. Yanagihara created Alatalab Solutions to develop research-based sting-relief preparations for consumer, professional and military use. 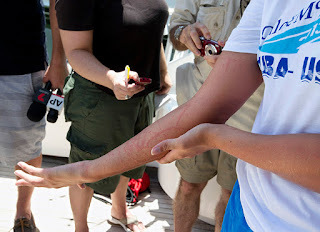 Her advice is sought around the world about a different approach to jellyfish sting treatment [see Cubozoan Sting-Site Seawater Rinse, Scraping, and Ice Can Increase Venom Load: Upending Current First Aid Recommendations] and her innovative cream started to be used by individuals in commercial and military roles where they were exposed to venomous jellyfish. As a result, her handcrafted invention based on years of painstaking research her laboratory in Hawaii finally took shape. "The StingNoMore® product line provides rapid relief for stings of all classes of jellyfish including box jellies." The resident of Oahu is a Fulbright Specialist by the J. William Fulbright Council for International Exchange of Scholars, an assistant research professor at the John A. Burns School of Medicine and the Békésy Laboratory of Neurobiology in the Pacific Biosciences Research Center. So it makes sense many dive shops on Oahu and the ubiquitous ABC Stores in Waikiki started to carry her Sting No More products. "The products include military-spec (by the U.S. Department of Defense) cream in 10, 15 and 30 ml sizes and Sting No More Bonus Beach Set that includes a 20 ml Sting No More Spray to clean the site and inactivate stinging capsules and a 10 ml Sting No More Cream pump that speeds relief to the sting site in a skin-calming forumulation. The Sting No More Pro Set includes the Sting No More Spray, Sting No More Cream pump, and a reusable 45°C HotPack with heat that lasts for 45 minutes. The Sting No More MilSpec+ Cream is a greaseless concentrated cream with Skin Calming Agents compounded in a patent-pending cream formulation containing urea and other ingredients including 2% Diphenhydramine and Vitamin D.
People who have been stung use the Sting No More Spray to clean the sting site and inactivate the stinging cells. Then they use the rapidly absorbed Sting No More Cream for sting relief." Her company, Alatalab Solutions, specializes in venom research and the development of over-the-counter (OTC) preparations to provide relief from jellyfish stings and fire ant bites, as well as pharmaceutical preparations for professional divers, clinical applications used by healthcare professionals, and marathon swimmers. "At Alatalab SolutionsTM , state-of-the-art research tools are used to develop and test specific inhibitors of dangerous venom toxins and treatment approaches for envenomation sequelae. Our novel, peer-reviewed, patent-pending formulas were initially developed for clinical and professional use. After years of research and testing, the products are ready for consumers. Sting No More® is an over-the-counter cosmetic-category relief cream. It is fully FDA and FTC compliant. All ingredients are Generally Recognized as Safe (GRAS) for topical use in over the counter skin relief products by the FDA. All ingredients are pharmaceutical grade in purity. No colorants, preservatives or fragrances are used." For more information or to order StingNoMore products, visit here.